This week’s Secret Ingredient for Friday Foodie Fix is Cantaloupe. This time of the summer they’re everywhere. There are two main groups of melons, the musk or netted melon and the winter melon. Cantaloupe are part of the first group. 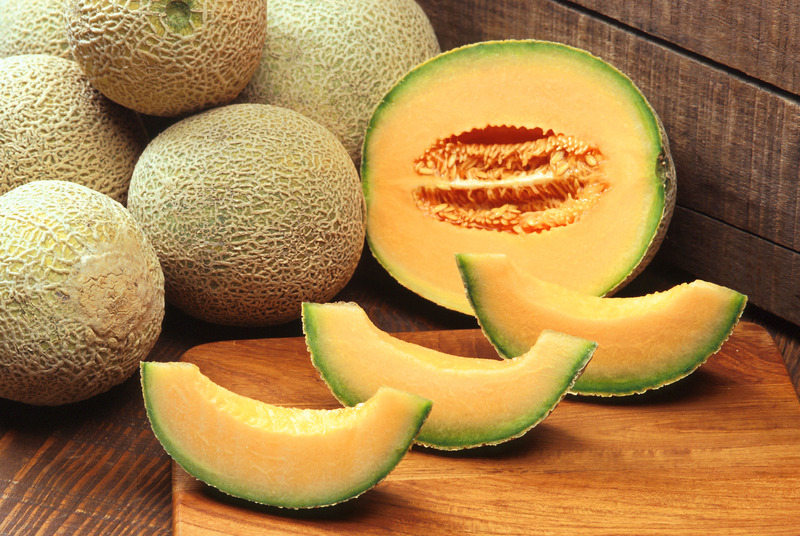 True Cantaloupe grown in Europe, take their name from a town near Rome called Cantalupo. These melons are smaller and rounder with a tougher skin than the ones we typically find in North America. What we typically have are netted melons which are called that because of the raised webbing on their skin. There are many clues that you can look for to find a melon that is ripe. If you tap the melon with the palm of your hand and hear a hollow sound, the melon has passed the first test. Choose a melon that seems heavy for its size, and one that does not have bruises or overly soft spots. The rind, underneath the netting, should have turned to yellow or cream from the green undertones that the unripe fruit has. The “full slip,” the area where the stem was attached, should be smooth and slightly indented, free from remnants of the stem. The end opposite the full slip should be slightly soft, and you should be able to smell the fruit’s sweetness subtly shining through, although be careful since an overly strong odor may be an indication of an overripe, fermented fruit. Cantaloupe is so fragrant that you will be able to test for its aroma of ripeness even if you purchase already cut cantaloupe, packaged in a plastic container. I’ve eaten Cantaloupe wrapped in prosciutto or plain but that’s about it. 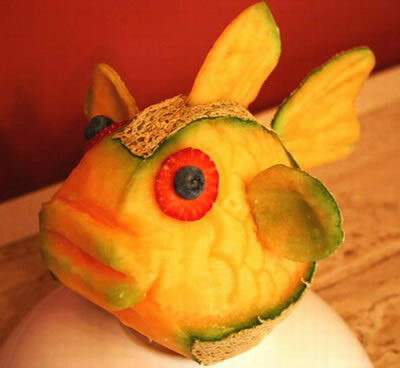 Thought this was an interesting way to use cantaloupe. I’m hoping that you will share some interesting and different recipes for ways to eat Cantaloupe. 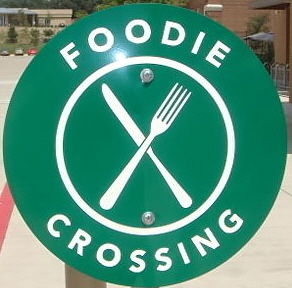 Next week will be a review of all the ingredients from this summer on Friday Foodie Fix. 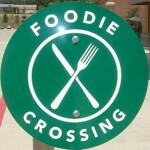 This way if you missed something you can gather more recipes or if you’ve used that Secret Ingredient you can add your link. I'm excited to read everyone's posts! Cantaloupe has never lasted long enough for me to think about making anything with it, it always gets eaten too fast! Jenn- Well not too many items for cantaloupe. If you keep it around long enough to create a recipe, please share it. I’m excited to read everyone’s posts! Cantaloupe has never lasted long enough for me to think about making anything with it, it always gets eaten too fast! Alta- What was in your salsa? Thanks for all the other info, too. It's always very helpful stuff. The cashier asked me what type of cantaloupe I had … if it was an Eastern Cantaloupe? I didn't know the answer. Anyway, hope you enjoy my creation … going to check out the others and then go to bed! Shirley- I agree, anything with prosciutto has to be good. I love what you created with cantaloupe. What a great gift. Thanks for all the other info, too. It’s always very helpful stuff. The cashier asked me what type of cantaloupe I had … if it was an Eastern Cantaloupe? I didn’t know the answer. I can’t wait for cantaloupe to get in season. It’s my husband and I’s favorite.. such a sweet summertime food. We like to eat it with ice cream.. blue bell of course! Sylvia- Yum, ice cream and cantaloupe. Can’t wait to give it a try. I can't wait for cantaloupe to get in season. It's my husband and I's favorite.. such a sweet summertime food. We like to eat it with ice cream.. blue bell of course! Sylvia- Yum, ice cream and cantaloupe. Can't wait to give it a try.